Printer software and a BevoBucks account are required. See below for how to obtain the printer software. Computers located on carrels next to the Tarlton Tech Desk (JON 3.220) and in the computer classroom (JON 3.222/3.223) print to the UTprint printers. (Printouts may be picked up from any UTprint printer on campus.) As before, a BevoBucks account is required. All printers print to 8 ½″ x 11″ paper only. The charge for black and white printing is $0.10 per page; double-sided/duplex printing (printing a single sheet on both sides) costs $0.20 per page for black and white printing. There is a color printer located next to the Tarlton Tech Desk. Select the UTprint Color option from the screen pop-up. The charge for color printing is $0.40 per single-sided page and $0.80 for double-sided pages. (There are a limited number of computers on the Library's 2nd floor for public use. Printing from these public terminals uses the UT Libraries printing and copying system). Make sure your BevoBucks account is funded. Register on any of the UTprint printers by using the touch screen to enter your UT EID and password (you only need to do this once). Once registered, swipe your UT EID to view your print jobs. Go to any UTprint printer in the Law School or across campus, swipe your UT ID on the printer's card reader, and select your print job. Forgot your UT ID? Enter your UT EID and password on the touch screen to retrieve your print job. To print to the color printer, select that option from the print software pop-up. The color printer is located next to the Tarlton Tech Desk. Need to use your own stationery? Ask for assistance at the Tarlton Tech Desk. Check your BevoBucks account: it will tell you if your print job went through and if your account was actually charged. You will only be charged for the print jobs you release. Pending print jobs remain in the the system for 48 hours before being deleted. Contact the Tarlton Tech Desk on the 3rd floor for additional assistance. To print from your laptop to the UTprint printers, you will need the appropriate software. Please contact the Tarlton Tech Desk on the 3rd floor, and they will help you download the necessary drivers for printing. Alternatively, you can download the appropriate software from UTprint. For Windows, look for "Windows" under the "Drivers" section. Click on "black and white" and/or "color" to download those respective drivers to your computer. For Macs, look for "macOS" under the "Drivers" section. Click on "all drivers" to download the Mac print drivers to your computer. Note: If you installed print drivers for Law School printers prior to August 2017 (for Windows laptops) or June 2017 (for Mac laptops), you must install the new drivers. The new drivers allow for you to print to any UTprint printer at the Law School and on campus. Staff at the Tarlton Tech Desk on the 3rd floor are available for assistance if you have any questions or problems. The Library has three standalone scanners available: (1) 2nd floor KIC book scanner, (2) 3rd floor KIC book scanner, and (3) 3rd floor flatbed scanner with document feeder. One KIC Scanner is located near the charging locker on the 2nd floor, and the other KIC Scanner is located in the computer lab area on the 3rd floor. The KIC scanners provide for the scanning of bound documents in either color or black and white. It also offers a variety of output formats, including PDF, searchable PDF, JPEG, PNG, Rich Text/DOC, or audio. You can save your scans to a USB key, send the scans to an e-mail address, upload them to cloud storage, or even save them to a tablet or smart phone using a QR code. The KIC scanners also include an electronic user guide outlining how to scan and save images and how to navigate its settings and menus. There is no charge for use of the KIC scanners. The flatbed scanner is located in a separate carrel in the computer carrels near the Tarlton Tech Desk on the 3rd floor. Instructions are available for saving a scan as a PDF or Word document, which can then be emailed. The use of the flatbed scanner requires computer log-in and is limited to UT law students. UTprint printers can also be used to scan documents. Place the documents in the document feeder, log in to the UTprint printer using your student ID, choose the scan function, and enter the email address you would like the scanned documents sent to. Scanning with the UTprint printers is free. 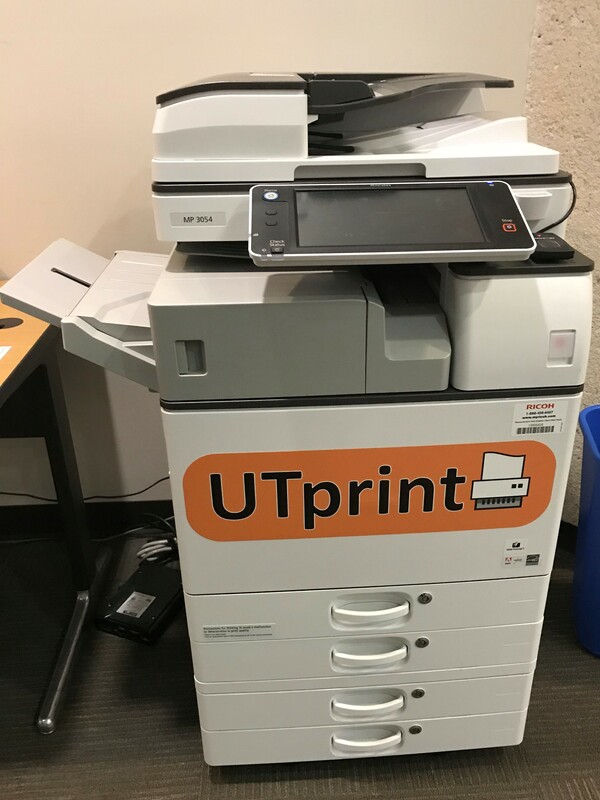 The use of the UTprint printers for scanning requires computer log-in and is limited to UT law students.